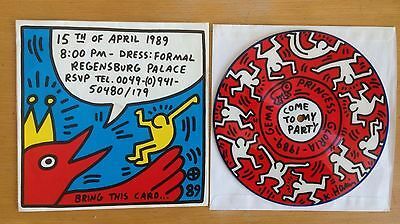 DESCRIPTION :The Rarest Keith Haring Art Cover & Picture Disc: Princess Gloria von Thurn & Taxis - Come to my party. It was used as a ticket for visiting the party. The invitation song on the record is performed by the princess herself. Superb condition !!! EX : The condition that we usually find. The record has been played a few times. The cover is nearly perfect. Admit corners slightly turned. VG++ : Clean copy with light scratches. Of course it had been played more often but it’s still in good shape. The cover is still correct. VG+ : The record has suffered more but it’s still audible without great scratches or jumps. The listening and cover’s condition are acceptable. But then i can’t get responsability on lost parcels. Thank you !! !